Today was Day #7 of Chocolate and Mint Theme Week, and Day #1 of Chocolate and Hemp Theme Week. Yes, but let me be clear. When I said hemp, I'm referring to hemp seeds, hemp milk and/or hemp fiber used to make clothing, twine and other goods. I won't be featuring a recipe for Alice Toklas brownies, or psychoactive chocolate bars riddled with THC this week. Some of you will be disappointed by this clarification, others relieved. Chocolate has enough interesting chemical properties related to pleasure receptors that I believe it can stand on its own in this regard. This may be good news, as toasted hemp seeds can be tasty; and hemp milk (made from hemp seeds) is one of the better tasting "filks" (fake milks) on the market. So, could we see hemp seeds in more chocolate bars in the future? Maybe. Today's Cacao Hemp Walnut with Mint bar, from Thunderbird Energetica (Austin, TX), was loaded with complex flavors: the moist texture, and slightly fruity flavor of dates, the rich flavors of cacao and coconut, the satisfying small chunks of walnut, and an occasional sparkle of fresh mint. The hemp seeds may have lent a mild nutty taste to this bar. It was difficult to pick them out specifically. 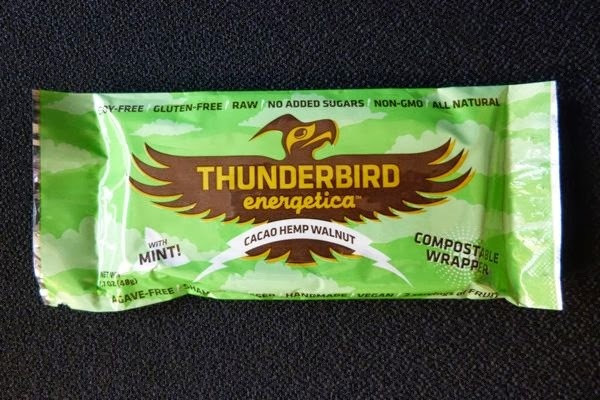 The Thunderbird Energetica line of energy bars is the creation of Taylor and Katie Thunder, and they've been offering a range of vegan, dairy free, soy-free and gluten-free bars -- with mostly organic ingredients. 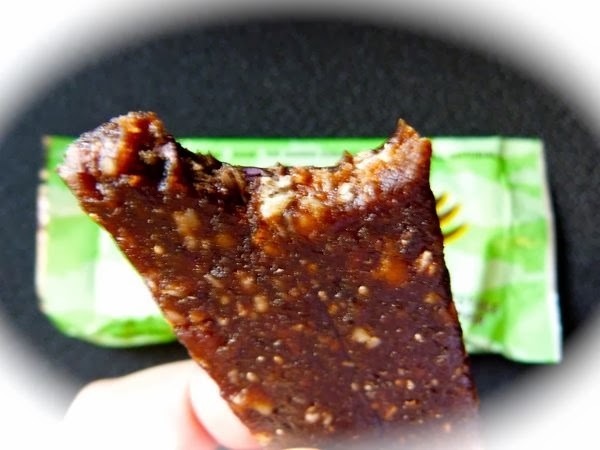 The text on the (compostable) wrapper on my bar also indicated that this batch contained no added sugars, was all natural and non-GMO,...and was shaman-blessed and agave-free. That's a lot of "non's" on one wrapper -- and a good example of how new health foods become established in the early stages. "We're against, or not like, the established products!" they seem to shout. I'm grateful for healthy, good-tasting food. I'm also waiting for the "with" language, and healthier products for all, to become the new norm.